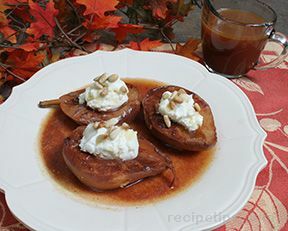 Wonderful way to enjoy fresh pears for a light fall dessert. 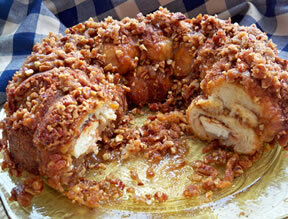 In a small mixing bowl stir together apple juice, cinnamon, brown sugar and melted butter. Heat in microwave just to dissolve the sugar. Cut pears in half, lengthwise; core. Keep stem in tact for a pretty presentation. Place cut-side up, in baking dish. Pour apple juice mixture over all. Bake in oven for 50-60 minutes until pears are tender. Meanwhile, mix together cream cheese, goat cheese and honey. Remove pears from oven, let cool slightly. Place dollop of cheese mixture in center of each pear. Top with drizzle of honey and sprinkle with pinenuts. May serve with apple sauce on the side.